I'm hoping this will be like a long overdue conversation with a good friend. While there's catching up to do, it's a comfortable conversation because we both know the other wasn't really far from mind. It's been an interesting year, interesting in the way of the Chinese curse of "may you have an interesting life". There have been some very good days, and some very difficult. But most of the days have been just the kind of comfortable ordinary we all hope for. Shortly after my last post, my parents fell very ill. We nearly lost my mom first, and just when it was clear that she would survive, my dad became desperately ill and was hospitalized. He was soon diagnosed with metastasized lung cancer and he was gone by the beginning of July. My sisters and I didn't handle this well and we are still trying to find our way back. I have incredible respect for the rights of others to believe differently from me. I have my own perspective on politics, as do you, and that's not what this blog is about. But I have to tell you, there are days that I am physically heartsick over the way we speak to each other. I am constantly torn between standing up to the bullying and standing back from the fray. All too often I am struck dumb by the hatefulness spewed in the name of love. This has kept me silent, hoping for the ugliness to pass and fearful that it may never. After struggling mightily with the idea of retirement, in the end, I have found that I have finally settled into a comfortable place. At last I had the time to make the messes, mistakes and discoveries I had avoided while rushing to make deadlines. 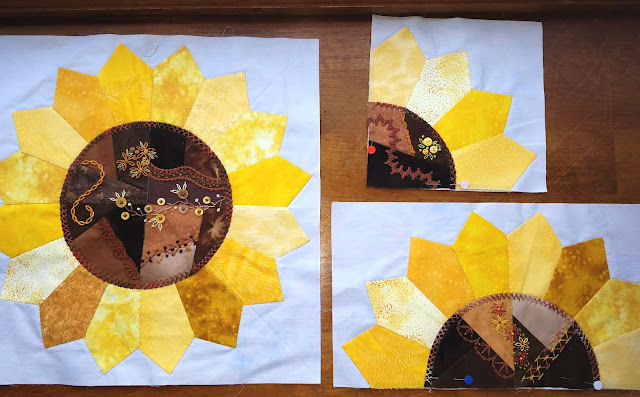 I still have moments of guilt at not being "productive" for the first time in my life, but they are fleeting and quickly forgotten as I practice a new embroidery stitch or take a stab at dyeing my own thread. For the first time in a very long time, I have friends I can hang out with, and make stuff with, although I still struggle with the concept that the phone dials out. I am content in my studio with all my toys close at hand. What a joy to simply create for my own pleasure, with no thought to how to teach it, or sell it or if anyone else will like it. But the teacher in me is restless. It's never been enough for me to learn something new. I've always felt that it's not really mine until I can give it away. I get such joy in sharing what I've learned. And I've started this great big new project and I'm learning so much in the process. I keep thinking of how much I'd like to share it and then remember that the blog has fallen silent and awkward and stale. So, hello once more, my friend. Shall we begin again? So good to hear from you. I love hearing what you are/have been doing. I totally understand about the political think. My opinion is, if you don't like it now, do something about next election. Meanwhile, shut up and get on with life. We all don't agree and that is a good thing. Otherwise, my goodness! how boring it would be. I really struggled with the first 3-4 months of retirement. I was so positive it would give me all the time I wanted to quilt and design and try new techniques. The change to no specific routine threw me. I am finally adjusting ... and, yes, there was loss during that time too. I am very glad you are back on the blog and still finding joy in what you do so well. Welcome back, my friend! Welcome back! I'm sorry to hear of your Dad's passing. You're clearly a strong, introspective person and will find your way. I'm blessed to have my Dad who is 86 but his health is declining, so I try to spend as much time with him while I can. I've missed your blog but am excited that you have come back to it. Your work is beautiful and I've personally learned a lot from you. Yes, let's begin again. So very sorry about your dad. So sorry to hear of all your trials and sorrow over the past year and hoping your quilting can help take you to your 'happy place'! 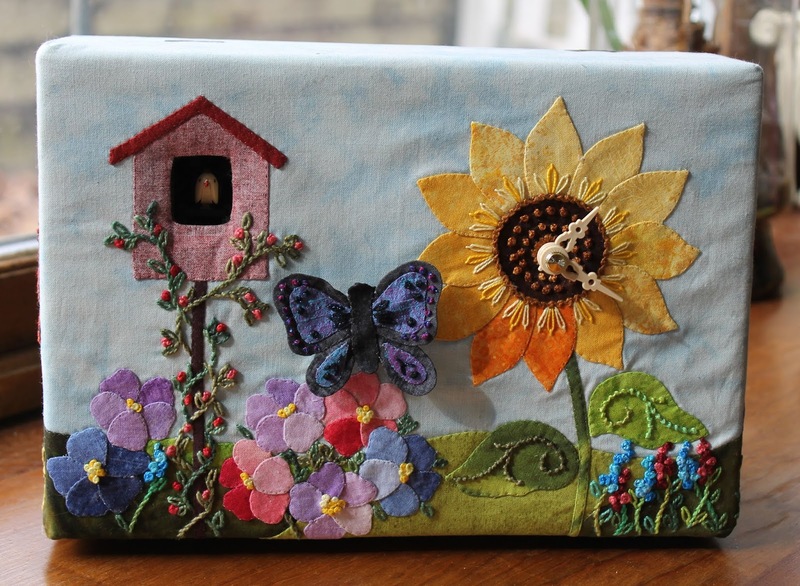 I have to say that the ethos of the Slow Stitching Movement is increasingly striking a chord with me! Hang in there...there are kind people out there. Welcome back! It's been awhile, but I always hoped you'd want to write again. 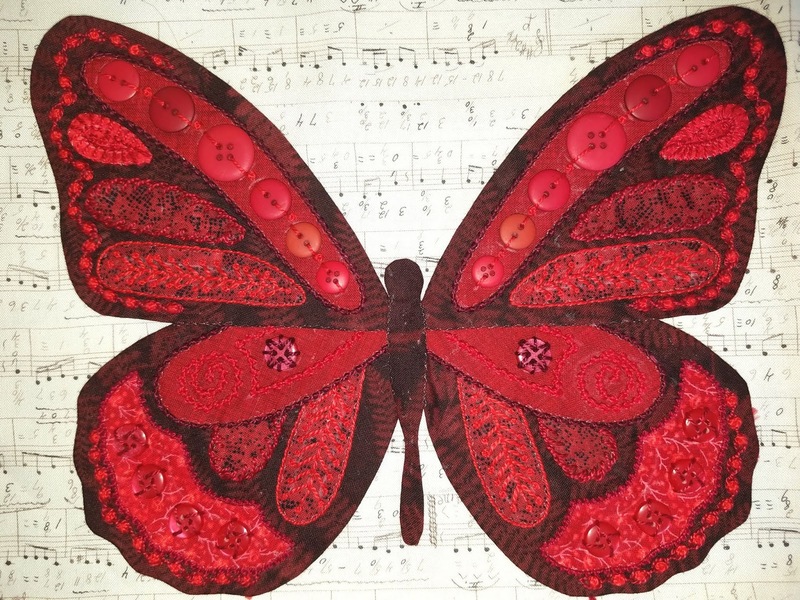 Love the red wooly butterfly! Welcome back. I just read you blog 3 months after it was written so my condolences are belated. It is so hard for a daughter to lose her dad, her rock. But glad your mom made it through. Looking forward to the "new" beginning. Welcome back. I am sorry for your loss and I too have lost close family. Although you may feel that you need to start over as a friend to so many of us you don't need to explain, you don't need to appease anyone, you just need to be the person that we know and care for. It is hard to reach out and say throw me a lifeline I'm drowning but as a community there are many who genuinely would not only throw the lifeline but would surround you with caring and support until you are able to dip your toe in the water and try again.